All the paper aeroplanes now have photographic instructions. Here are some pictures to celebrate! I’ve been doing a lot of updates to the paper aeroplanes on the main site over the course of the last month or so. I’ve now got 9 designs up and all now have full photographic instructions – including the designs that previously only had video instructions. If you notice any problems with any of these, then please post a comment and let me know! The Spyder is one of the better looking paper aeroplanes on the site. Doesn’t it look pretty? The Merlin is another one of the good looking paper aeroplanes. Behold its glory! Stunt paper aeroplanes aren’t always ugly. At least that’s what The Squirrel’s mother says. The Lion is one of the older paper aeroplane designs, but it still wants in on the action. The sly old dog cat. The last of today’s paper aeroplanes is The Piranha. Look at it. Then cry with joy. Paper Aeroplanes and Wing-Tip Fins – A few things to consider. When I meet other paper aeroplane enthusiasts (generally in smoke filled rooms, or dimly lit car parks) a debate I occasionally get into is whether putting wing-tip fins on paper aeroplanes is a good idea. As can be seen by a quick glance, some of the paper aeroplanes on the main page have wing-tip fins, and some do not. This is because I don’t think there’s any one-size-fits-all answer here: it all depends on the plane and the maker. Fins can be beneficial because they can be used to change various aerodynamic properties of the paper aeroplane – which can be used to good effect in skilled hands. However, fins can be a bad idea, especially if you don’t know what you are doing; and/or are not very precise with your folds; and/or make them in the wrong place. 1) Move the centre of lift to optimise pitch stability. 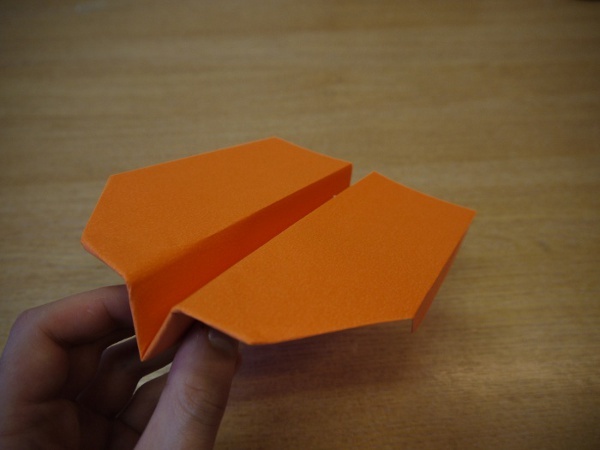 Fins can move the centre of lift of a paper aeroplane. By turning a bit of wing into a bit of fin, you largely nullify it as a lift producing surface. If the paper aeroplane has swept or delta wings (which is the case for most paper aeroplanes) then the fins will be towards the back of the plane. And if you create fins at the back of the plane, you also reduce the lift at the back of the plane – whilst the lift at the front of the plane stays the same. The relative position of the lift hence shifts forward. This could be a good or bad thing depending on the plane. If your paper aeroplane tends to nosedive, then its centre of lift may be behind the centre of gravity along the longitudinal axis of the plane. 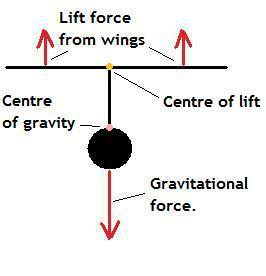 Shifting the centre of lift to approximately meet the point of the centre of gravity can help it maintain level flight. However, if the centre of lift is already ahead of the centre of gravity – meaning it has a tendency to pitch upwards – then shifting the centre of lift yet forward will only exacerbate the problem. 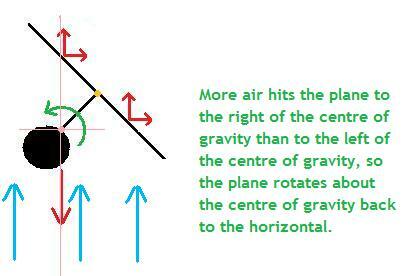 2) Shift the centre of gravity of the plane up or down the vertical axis. If you make a paper aeroplane with fins that point downwards, you are shifting mass down the vertical axis of the plane. This is a good thing for enhancing the keel effect and is why, when I do make paper aeroplanes with fins, I generally make them so they point downwards. The exceptions to this (paper aeroplanes such as The Piranha) generally come about because it would be impractical to turn the fins downwards on such planes. If the paper aeroplane has fuselage that tapers towards the back (such as The Piranha), it will tend to lack directional stability unless fins are present. The plane will easily yaw and bank as it flies, potentially humiliating you in front of crowds of onlookers. The reasons for this are explained in an earlier post on directional stability. The inclusion of large fins that are PARALLEL to the centre line of the plane, will help correct for this. You are creating vertical surface area behind the centre of gravity, and in all likelihood, one with a long moment arm. So all good you might think? Yes? Yes? 5) Mess up a plane’s directional stability. a) They are not made so they are parallel to the centre line of the plane. This is obvious, but often ignored. The simple solution is to make your folds more precisely. b) They are made ahead of the centre of gravity. This generally only happens in planes with canards, like some variants of paper aeroplanes like ‘The Spyder’. Essentially, by putting fins near the nose of the plane, you’re doing the opposite of what is recommended here. If a fin is not parallel to the centre line of the plane, it will increase drag – as you can see if you look at a plane from the front. (ii) aeroplasticity -or, to use more simple language: the plane changes shape during flight. This is especially a problem for paper aeroplanes like the dart. During the launch phase of the flight, aerodynamic forces will tend to push the fuselage together all the way along the plane; however, as the paper aeroplane starts to slow down, the fuselage will come apart in a V shape at the back. This can turn a pair of fins into a pair of airbrakes. This is why fins should usually be avoided in dart-type planes. Paper Aeroplanes like The Dart change shape slightly during flight. This can turns fins (and other parts of the plane) into airbrakes. 7) Act as accidental elevators. 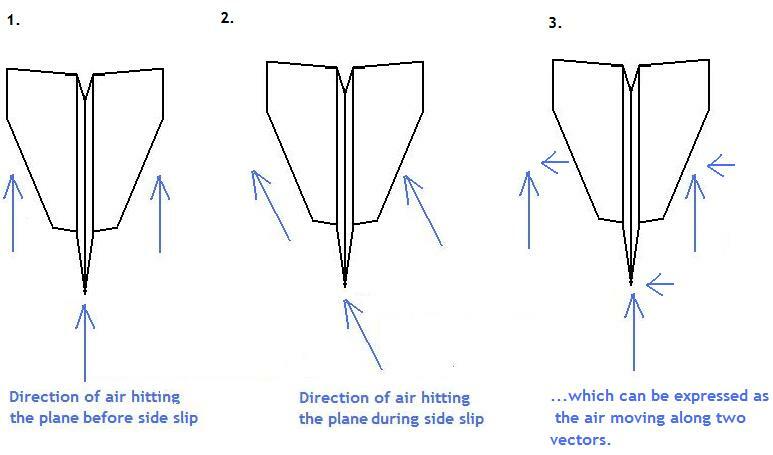 If your paper aeroplane has a fin that is not parallel to the centre line of the plane (either due to imprecise folding or due to the effects of aeroplasticity) AND it is not perfectly vertical (either due to imprecise folding or aeroplasticity) then it can deflect air upwards or downwards. This can have the same effect as tweaking the backs of the wings upwards or downwards… however, the problem is it’s difficult to spot, so you might be creating extra up or down elevator without knowing it. – Fins need to be parallel to the centre line of the plane, so fold them precisely and avoid them in planes like The Dart. Otherwise, you’ll just create drag, cause unwanted yawing moments and mess with your plane’s lift. – You should generally have your fins pointed down rather than up. This shifts the centre of gravity lower on the vertical axis of the plane, good for enhancing the keel effect and lateral stability. – Well made fins can aid directional stability on *some* planes (especially those with fuselage that tapers or disappears at the back of the plane), but they will only help if made precisely and towards the back of the wing, not on canards. – Fins can shift the centre of lift of a plane to aid pitch stability. Increasing the size of the fins at the back shift of the plane shifts the centre of lift forward. Reducing the size of (or eliminating the fins) fins can shift the centre of lift backwards. – Fins can increase wing rigidity. This is useful if you notice that the wings of your paper aeroplane do not hold their shape during the plane’s flight. 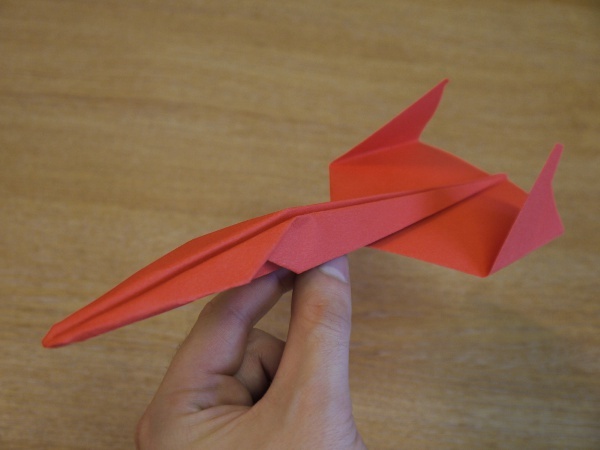 If you want to start making your own paper aeroplane designs, here’s one very useful, but also very simple, fold that you might want to incorporate. It’s a fold that helps give paper aeroplanes lateral stability by shifting the centre of gravity down to the base of the fuselage – useful for enhancing the keel effect. It also shifts the centre of gravity to a position forward of the longitudinal centre of the plane, which gives the plane greater directional stability (as discussed in the earlier post here). This means, when you continue to make the other folds of your plane (whatever they may be), you’ll be starting from a position where the centre of gravity is shifted towards the nose of the plane and the base of the fuselage. This is just what you want if you want to use the keel effect for lateral stability and to increase the surface area of paper and (and the moment arm of the end of the fuselage and the fins) behind the centre of gravity along the longitudinal axis of the plane. Straighter, more stable flight awaits! 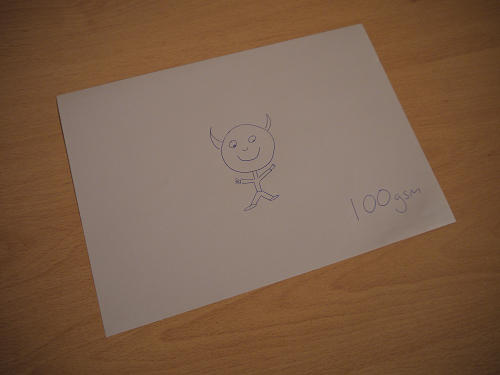 Generally, when making paper aeroplanes, I use standard 80gsm (grams per square metre) copier paper. It has a good balance of weight and stiffness and, all round, is a pretty good aeroplane paper; however, it is not the only option and sometimes not the best. Through some preliminary experimentation I’ve found the different paper aeroplanes on the main site can be optimised for a paper that suits their individual structures and roles. Generally, this weight of paper is too light and flimsy for it to be good aeroplane paper. 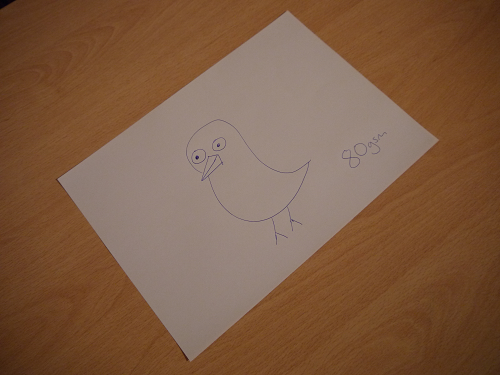 It’s ok to use if you have no alternative; however, if you’ve got the choice, go up to 80gsm. Although you never want a paper aeroplane to be too heavy, this paper’s lack of weight often means that your plane cannot hold its shape during the launch phase – causing it to go off course, deform and crash. This kind of paper does hold the slight plus point in that, because it’s so thin, you can get away with slightly more complex folds as the paper doesn’t bunch up so much. Some planes benefit from the extra stiffness if you use this as your aeroplane paper. The Merlin, in particular seems to perform better with 100gsm, perhaps because the extremities of the wings are pretty flimsy. Javelin type planes can also perform well using this kind of paper. Card: Card is too thick for all but the most basic planes. 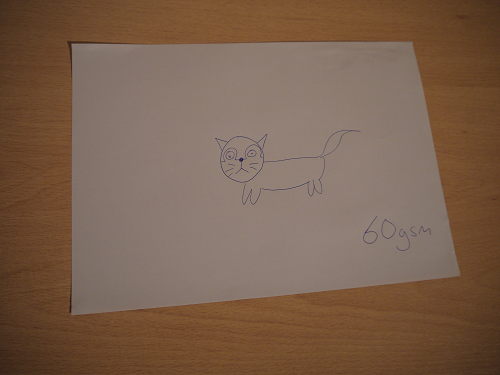 You simply can’t do complex folds with card and it’s too heavy for the amount of lift planes of A4 size can produce. On the downside, I’ve observed shiny paper can sometimes lead to the folds holding together less well, as you don’t get as much friction from one bit of paper to another. However, some planes, like The Monkey, where all the folds are held securely in place by other folds don’t have this problem. 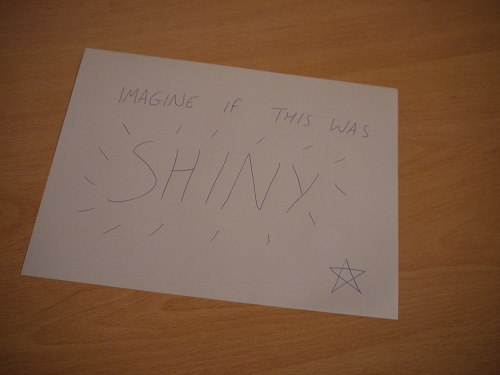 Shiny paper can be an optimal aeroplane paper in planes like that, as it seems to reduce drag. Let’s add one more factor to our list of features that keep paper aeroplanes flying straight. 5. Design your plane so that it has swept or delta wings. Well lets look at two wings configurations, one straight, one swept. The diagram below shows both configurations flying straight forward, with zero yaw and zero sideslip. 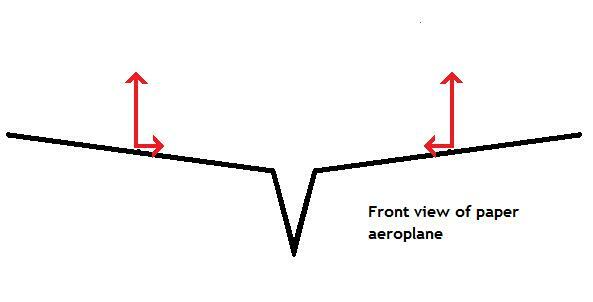 In this scenario, both sides of the straight wing configuration are presenting equal frontal surface areas to the oncoming air. This is also the case for both sides of the swept wing configuration. Note: for simplicity’s sake let’s assume that the centre of gravity of each wing configuration is right at the very front of the centre of the wing. The centre of gravity is denoted by the pink dot in the diagrams. However, let’s say the plane starts to yaw by 45 degrees. Again in the situation the each side of the straight configuration continues to present exactly the same surface area to the oncoming air. This means that the yaw is not corrected. However, in the swept wing configuration, the side on the outside of the yaw is presenting a greater surface area to the air than side on the inside of the yaw. This helps correct the yaw by pushing the swept wings back into the original position as seen in the first diagram. Actually, there is more going on than described in this article; however, this is intended as a very basic introduction. 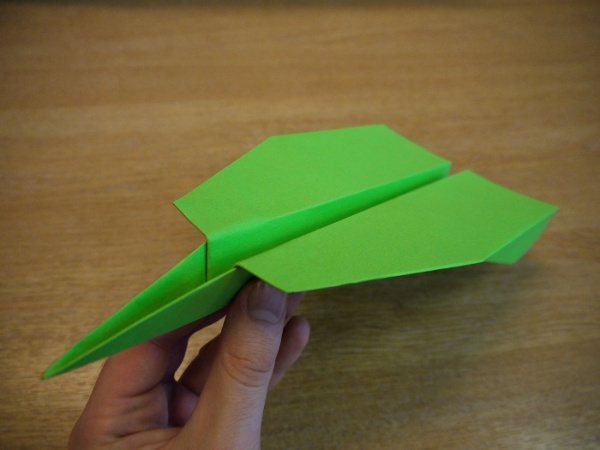 In the last post I discussed simple ways that you can modify most paper aeroplanes so they fly in a straight line. 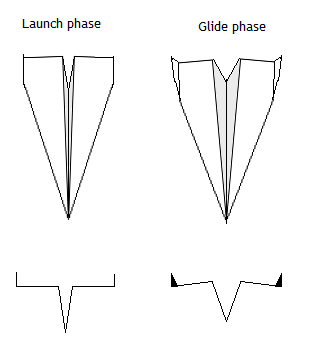 Those techniques can improve the directional stability of virtually any paper aeroplane with minimal modification to the fundamental design. In the previous post the paper aeroplane we used as an example was the classic dart, where the centre of gravity was right in the centre of the longitudinal axis of the plane. However, using certain simple folding techniques you can shift the centre of gravity. This can be used to give even a perfectly rectangular fuselage a certain level of directional stability. The reason why this works is the same as the reason in the last post. As you will see in the diagram below, the surface area ahead of the centre of gravity is smaller than the surface area behind the centre of gravity. This means the ‘weather vane’ effect occurs again, just as it did in the earlier example. An ultra simple way of doing this is to add a paper clip to the nose of the plane; however, I like my paper aeroplanes to be made out of one sheet of paper alone, without additions, sticky tape or cutting. If you are subjecting yourself to the same constraints, you can shift the centre of gravity along the longitudinal axis of the plane by making sure there is more paper (or mass) ahead of the longitudinal centre of the plane than behind it. You can do this by using any one of a number of folds. For example, when making ‘The Lion‘ paper aeroplane, at the part where you fold the paper over itself and back towards the end of the instructions, that moves the centre of gravity forward relative to the longitudinal centre of the plane, because there is more mass ahead of the centre than behind it. 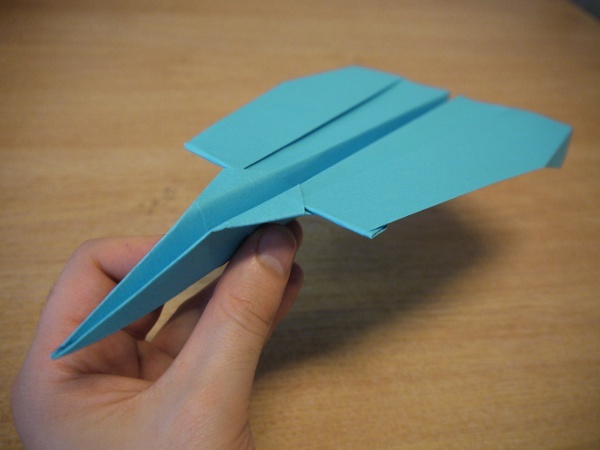 In fact, all the paper aeroplanes up on the site so far, with the exception of The Classic Dart, use some folding technique to shift the centre of gravity of the plane forward. I should note that, generally, shifting the centre of gravity is not the only technique you should use to produce directional stability. This is not because it is a poor technique in theory, it is simply because there are limits on how much you can shift the centre of gravity using folding techniques alone without sacrificing other useful aerodynamic features of a design. 1. Use the basic calibration technique for countering yawing, outlined here. 2. When you fold the wings, make sure the back of the fuselage is higher than the front. 3. Give the plane large fins towards the back of the plane (fins at the front will have the opposite effect). Of the latter two techniques, I generally recommend making the fuselage higher that the back rather than making large fins, simply because it’s harder to get the fins perfectly straight than it is to get the fuselage perfectly straight. However, both of these techniques can be applied to almost any paper aeroplane without making considerable modifications to the fundamental design. So why do these things work? Well let’s look at a side view of a paper aeroplane, in this instance, the classic dart. In this design, the centre of gravity is right in the middle of the longitudinal axis of the plane, because there is no more paper (i.e. no more mass) at the back of the plane or at the rear, the only difference is that the folds are more concentrated at the front than at the back. This means that the fuselage of the plane is considerably higher at the back than it is at the front. In turn, this means that the section of the plane in front of the centre of gravity has a considerably smaller surface area than the back. This means when the plane starts to move sideways in the air rather than straight, the back of the plane will encounter more air resistance than the front. The plane will then rotate around the centre of gravity into the direction of the airflow, like a weather vane. 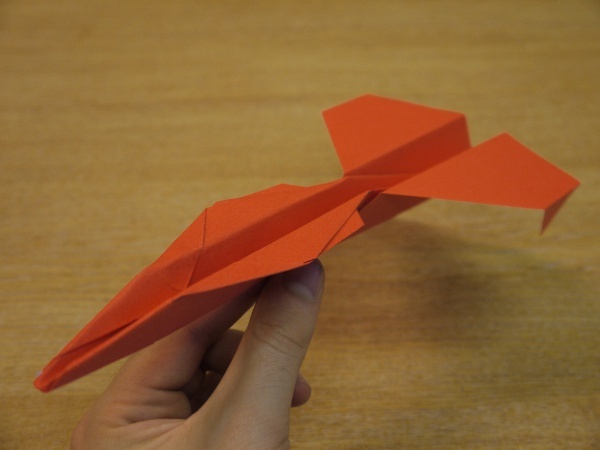 There are a number of ways to give paper aeroplanes ‘lateral stability’ – the ability of an aircraft to fly the right way up, and not to roll as it travels through the air. One method is to use the ‘dihedral effect’ as outlined in my earlier blog post here. Another method is to make use of the ‘keel effect’. The keel effect involves the positioning of the plane’s centre of gravity. The centre of gravity is the average location of all the gravitational force on an object. In simple terms, it is the point where an object (e.g. an aeroplane) balances. Some people call this point the ‘centre of mass’, because, in most instances you encounter, centre of gravity and centre of mass are the same thing… although the two concepts can be different out in space! In very simplistic terms, the keel effect means that aeroplanes with a centre of gravity below the wing are more stable than those with a centre of gravity above the wing. To start understand the physics of why the keel effect works, let’s look at a diagram. The diagram below shows a simple front view of a weight suspended beneath a wing with a dihedral angle of zero (so we can ignore the dihedral effect totally). Let’s say that in this second of time, the lift forces are entirely equal to the gravitational force on the aeroplane, which means that it is neither rising nor falling. The lift forces on each wing are equal, so that the centre of lift of the plane is exactly in the middle of the two wings. 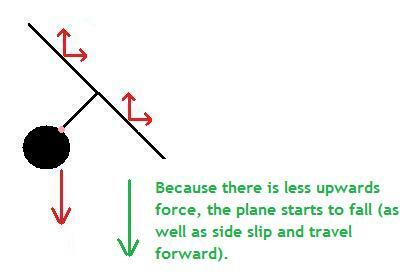 Also since there are no sideways forces at all, the plane is moving straight forward with zero sideslip. Now let’s look at what happens if the plane is disturbed during flight and starts to tilt to one side. At this point two things start to happen simultaneously. Firstly, because the wings are no longer level with the horizontal, so part of the lift force is directed horizontally. This causes the plane to begin to side slip. 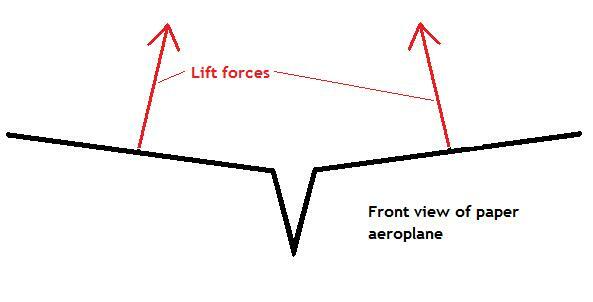 Secondly, because the wings are no longer level and some of the lift force is directed sideways, there is less upward force. This causes the plane to descend. Let’s go through factor number 1 using diagrams. We can represent the forces on the wings by breaking them down into two components, and upward force and a horizontal force. 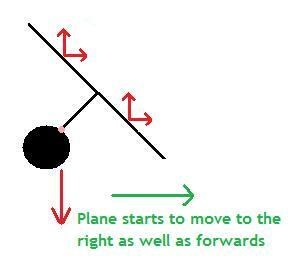 Given that there is now a force acting to the right (our right), the plane starts to move (‘side slip’) to the right. Once the plane starts moving rightwards, air starts to hit it in a leftwards direction. The pink line in the diagram above shows the horizontal position of the centre of gravity. 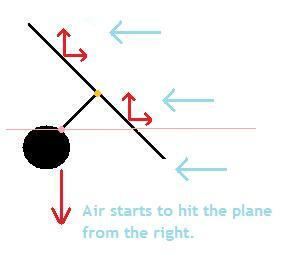 As you will see more air is hitting the plane above the centre of gravity than below it. Now lets look at factor number 2! So what lessons can we learn from this when designing paper aeroplanes? Well one key lesson is that if we make our planes so that the wings are above the centre of gravity, then they should have more lateral stability. This is already the case with most of the planes I’ve posted on the main website, with (at the moment) one exception, which is the piranha. The piranha is a slightly special case as it is not a plane that produces much lift, so the force vectors around the wings are different. Another lesson is that we can make our planes MORE stable by lowering the centre of gravity further below the wing. If you draw the diagrams yourself, you will see that the further down below the wings that you place the centre of gravity, the stronger the stabilising forces get. One easy way to do this is to make the fuselage higher and the wings stubbier. Unfortunately, this does mean that you also lose some lift; however, you can counter this by tweaking the back edge of the wings upwards very slightly upwards. This is the same thing as turning the elevators on the tailplane of a normal aeroplane upwards, often called ‘up elevator’. If you try making the lion or the merlin you can experiment with folding the wings higher up the fuselage than I do in the video. In fact, if I ever fly a plane in a competition, I usually DO make the wings slightly higher than I do in the video and add up tweaks to the back of the wings … this improves stability, at the expense of making the plane look slightly uglier! If this doesn’t work, it is usually for one of two reasons… either your wings aren’t producing enough/any lift! You can easily solve this by tweaking a tiny section of the trailing edge of the wings upwards by a very small amount. 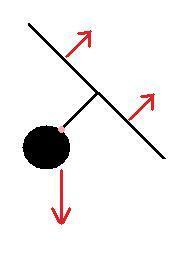 Without lift, you can’t have unbalanced force vectors causing the neccessary side slip. Another reason is that you have made the wings at an anhedral angle… which will counteract the keel effect. See my earlier post on dihedral angles to solve this. If you want to go advanced, another way to help produce the keel effect is to design a new plane from scratch, making sure that more folds are concentrated towards the bottom of the fuselage. I’ll be showing a few ways to do this in future posts. ****END NOTE**** I should add a note here on how the keel effect does NOT operate. 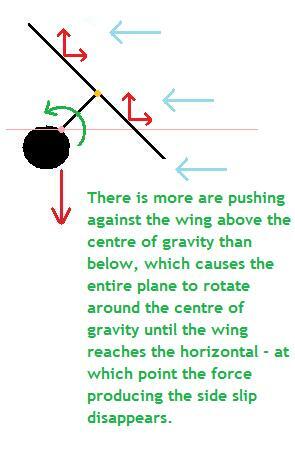 Some people think that a low centre of gravity will automatically cause a plane to right itself if it becomes tilted… with the centre of gravity swinging back under the plane like a pendulum. They sometimes say this effect (which doesn’t actually exist) is called the ‘pendulum effect’. One easy way to understand why this does not happen is to remember that the centre of gravity is the point where the plane balances. This is the case whether the plane is flying the right way up with its wings flat OR if the plane is completely tilted on its side, with the wings on the vertical. Whatever way you spin the plane around the centre of gravity, the weight on each side will always be equal. So, when the plane is titled, it is still balanced. In a vacuum a plane would be entirely happy to be tilted at any angle. The ONLY forces that cause the plane to return to its ‘correct’ flying position are AERODYNAMIC forces such as the air hitting the plane from the side when it is in side slip and the air hitting it from below when it is in descent. UPDATE (August 2012): I’ve posted a basic fold for enhanching the keel effect. In simple terms, ‘lateral stability’ means that a plane will fly the right way up and not roll as it flies. One easy way to give paper aeroplanes lateral stability is to make use of the ‘dihedral effect’. Now, to some people, the word ‘dihedral’ may sound like something quite complicated, but it’s actually pretty simple. It means that from the root of the wing on the fuselage (the body of the plane), the wing slopes upwards. If the wings slope downwards this is called ‘anhedral’. Here’s a little diagram. 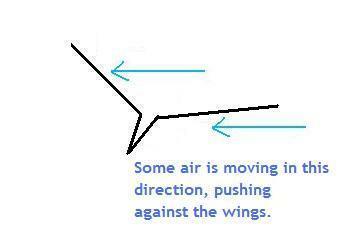 The degree to which the wings slope up from the horizontal is called the dihedral angle. If the wings are exactly on the horizontal (not sloping either up or down), then the dihedral angle is zero. So how do dihedral wings stop paper aeroplanes from rolling? Ok, so how do vectors come into this? Hopefully, you’re still with me. Now let’s assume that the paper aeroplane is really well made so the wings are exactly symmetrical. As the paper aeroplane flies, it is kept up in the air by the upward component of the force. 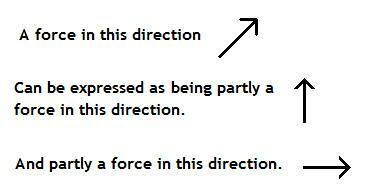 The sideways components of the force are in equal and opposite directions, so they simply cancel each other out. All is well in the world. The plane is flying straight and is perfectly stable. As you will see, on the force vectors on both wings have changed. The wing on the left (our left) is now sloping even higher. 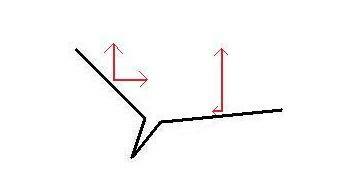 This leads to the upward force on the wing decreasing… but the sideways force increasing. The wing on our right is now almost completely flat, which leads to the upward force increasing, but the sideways force almost disappearing entirely. 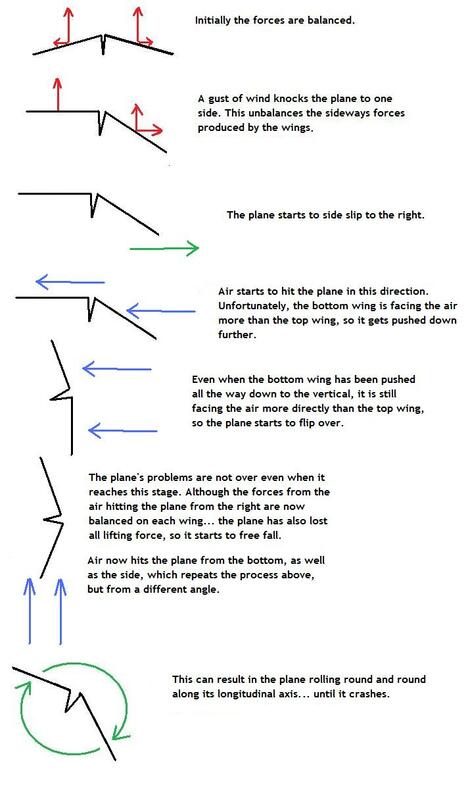 Well the first thing to note is that the plane does not automatically self-right because of the forces on the wings. Although it is tempting to think that the extra upwards force on the right wing will push that wing upwards and level the aeroplane, this is not the case. 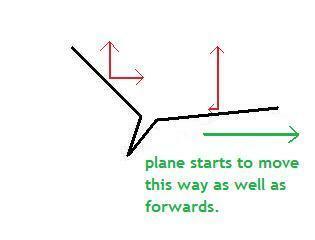 The reason why is that the sideways force on the left wing is pushing it rightwards, which maintains the tilt. What actually happens is this: because the opposing sideways forces are now unbalanced, the aeroplane starts to move to one side AS WELL as it’s forward motion. This is called ‘side slip’. Once the paper aeroplane starts to move to the side as well as forwards, suddenly the direction that the air is hitting the two wings changes. Let’s look at the aeroplane from the top to see what is happening. The oncoming air now pushes against the plane with a force with a leftwards component. It is these forces that push the wings back to their original position. The oncoming air hits the underside of the right wing and pushes it up. The air also hits the top side of the left wing and pushes it down. As the wings return to their original position, the unbalanced sideways force disappears (or, in other words, rebalances)… which means the side slip stops. At this point the plane has righted itself and continues flying straight and level. The entire process I’ve just described is the ‘dihedral effect’ and I hope you can now see that when you make paper aeroplanes, you should give them dihedral wings if you want your flights to be straight and stable. To understand the dihedral effect even better, it is useful to look at what might happen if an aeroplane has anhedral wings. As you will see, the result would not be good for your paper aeroplane! If you want to experiment for yourself, click here to go back to the paperaeroplanes.com main page, then either choose to build ‘The Lion’ or ‘The Merlin’ planes. Both of these designs can be easily modified to have dihedral or anhedral wings. If you make a design and give it dihedral wings, it will tend to fly in a reasonably stable manner and will not roll. If you give the design anhedral wings it will tend to roll rapidly as it flies. If your experiment doesn’t work, this is usually because your aeroplane doesn’t have enough lift to begin with! The dihedral effect will only work if your wings are producing lift – because without lift, there are no lift vectors to come into play. The easy way to rectify this is to tweak a tiny part of the tail edge of each wing upwards, but only very slightly.